I love small tables for many reasons. Their small footprint is easier to fit in a small home and are readily moved. Several years ago I designed a minimalist computer desk. Looks great, but no drawers and only moderate surface for spreading out relevant materials [such as at tax time]. Multiple small tables make perfect temporary surfaces. Small tables are great for beginners and even experienced woodworkers looking for a project with real joinery (mortise & tenon and half lap in this case) with minimal material expense. Handy to have around the house, and they are perfect gifts for those living in cramped spaces. 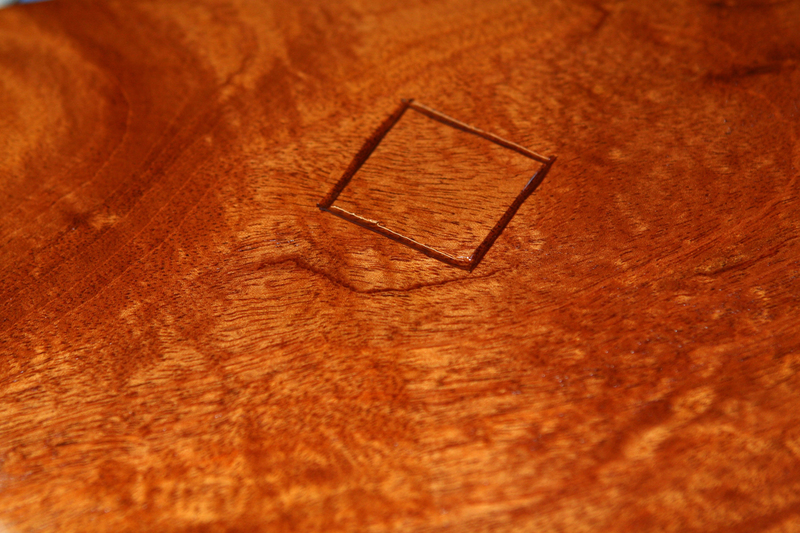 Sinker Honduras Mahogany from Greener Lumber, LLC. 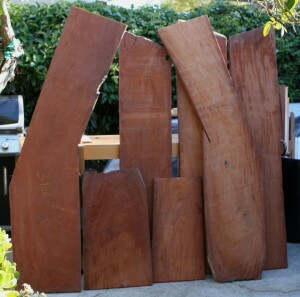 As I look at my off cut collection, it is mostly long, skinny pieces and stubby wide chunks. Neither are suitable for cabinet work. 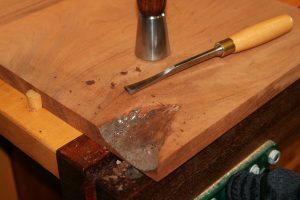 Yet, wide stubby pieces can be made into small tabletops and skinny pieces might work for legs and stretchers to go with a small top. That is the ideal. 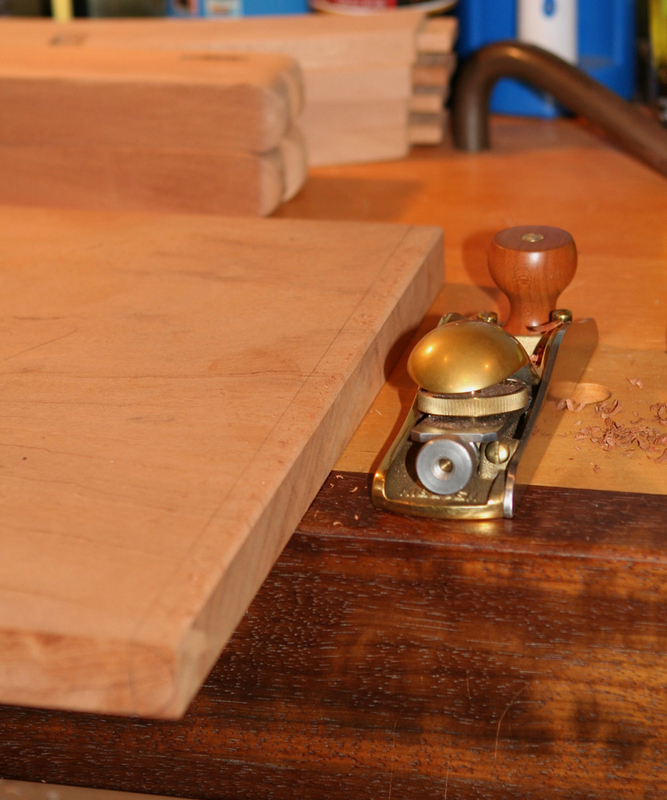 In practice, I usually end up using good-sized boards to cut out legs. That is guided by my search for rift sawn, fairly straight grained material with all legs consistent in color and texture. 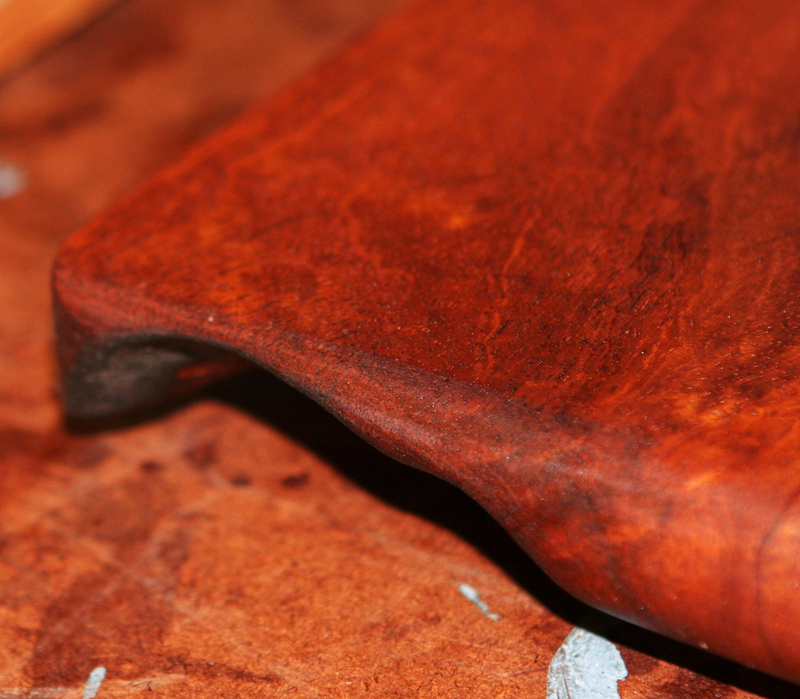 The top for this project is from a leftover piece of sinker Honduras Mahogany [www.greenerlumber.com]. The finished size will be 1 x 12-1/2 x 15 inches. This scrap has a punky area on what will become an edge. 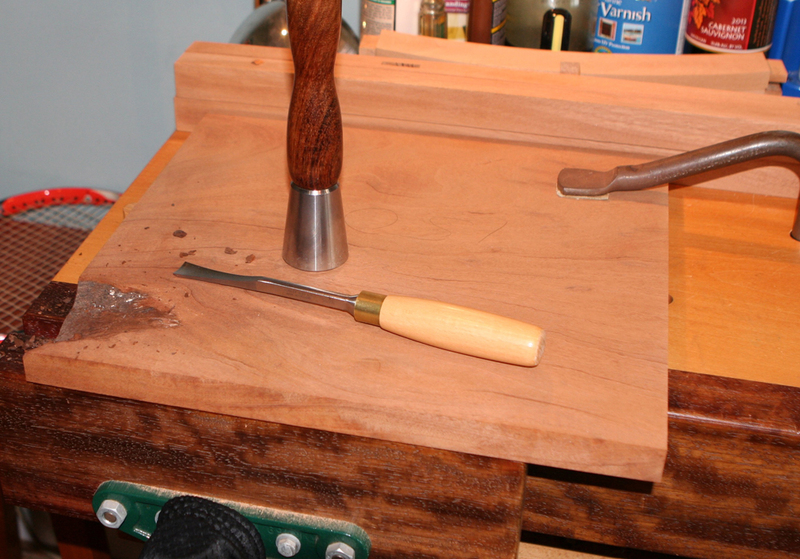 I cleaned up the loose material with a carving gouge. That area will be visible on the edge, but does not come to the top surface. 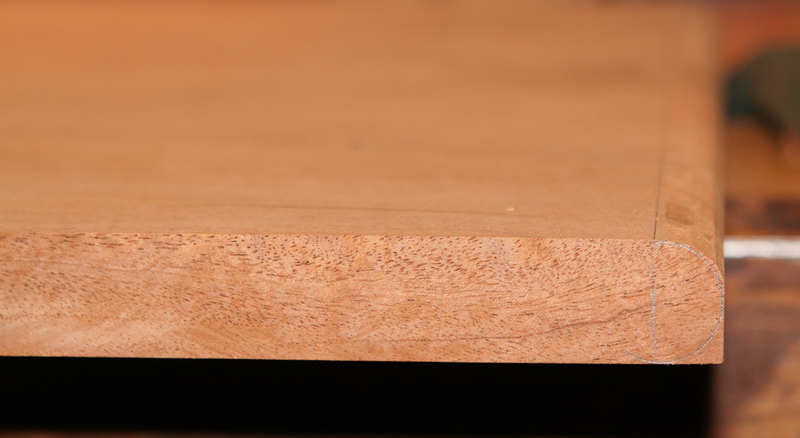 The thinnest area will be somewhat fragile, but should hold together for the use such a table will receive. 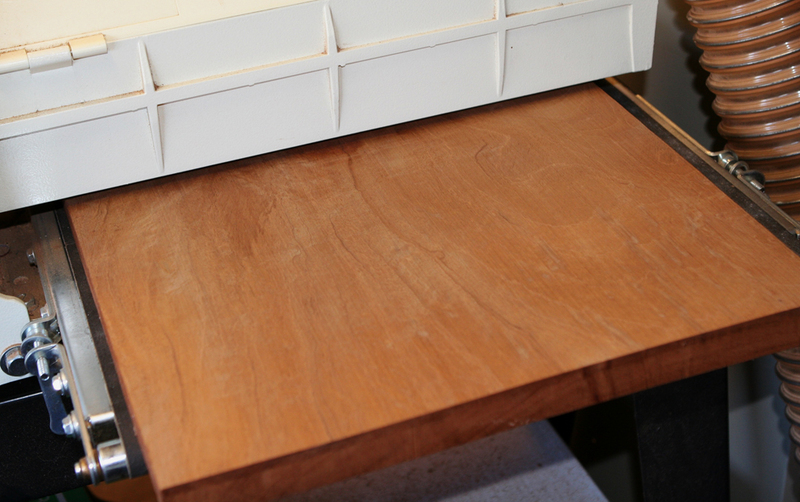 The plank scrap was pretty flat so I was able to run it through the drum sander to level the top and bottom surfaces. 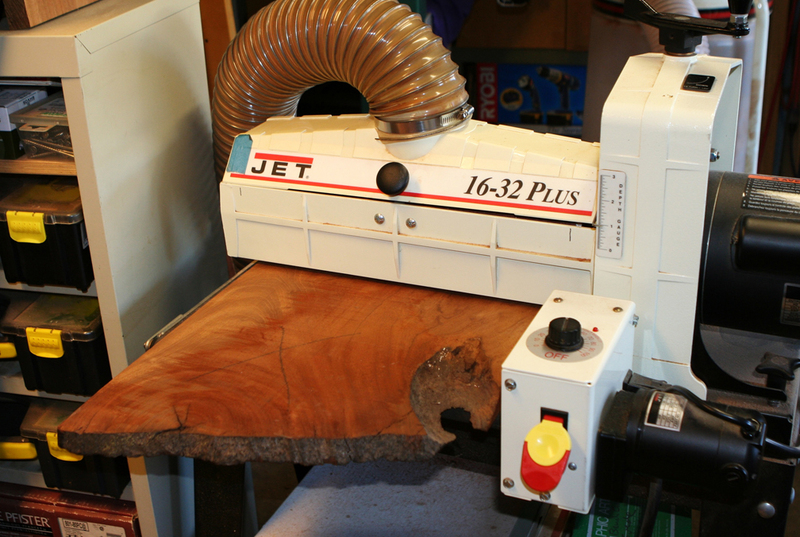 It would have fit my bench top planer once trimmed to final size, but the drum sander worked fine. I created a round over (top and bottom) on the left and right edges. I guess that might be called a bullnose. 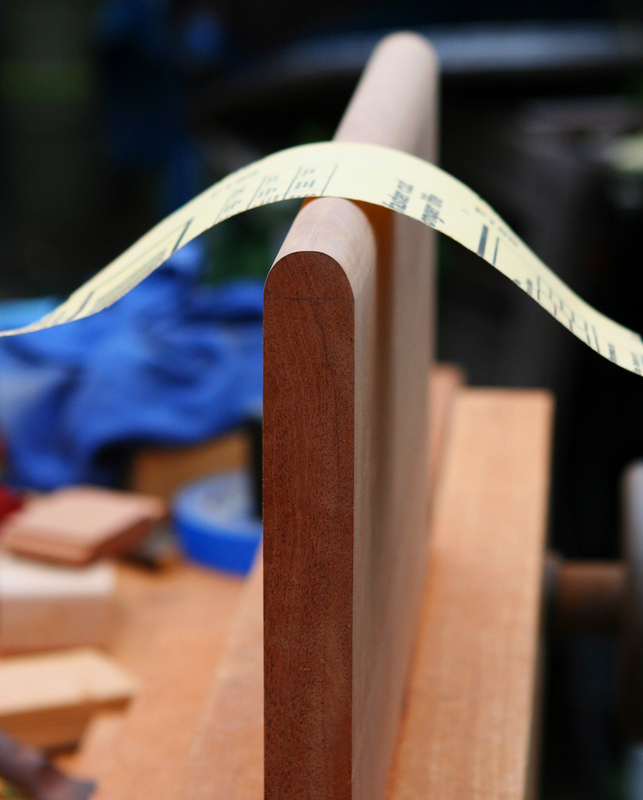 The front and back edges are flat but have a nice curve into the bullnose ends. I cut a 45 degree corner with a back saw, then used rasps to create that blended curve, which comes to a point on the bullnose. The Buhl diamond was roughly carved on the underside using a V-chisel. 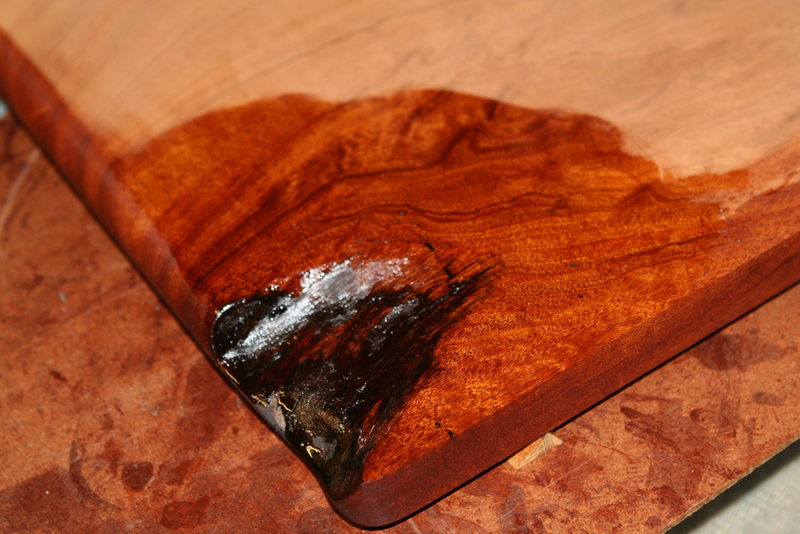 Final sanding was followed by multiple coats of a wipe on oil/varnish blend. Next up are the legs and stretchers. I love the handmade bullnose.